This 33 page book is an excellent review of Tesla's major inventions in the areas of mechanical and electrical engineering. Starting with a biographical section that mentions various aspects of Tesla's work that have already been adopted, the author moves on to the Disk-Turbine Rotary Engine. From there he ventures forth into the domain of Tesla's work with AC power, for which the inventor is better known. 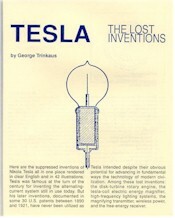 From high frequency lighting techniques to the world communications system, Tesla� The Lost Inventions is a perfect primer for all students of Tesla, young and old alike.